A unique and historically significant wooden figurehead from a 19th Century Brazilian slave ship is going under the hammer at Sworders' Winter Country House Sale on 9 December 2014. 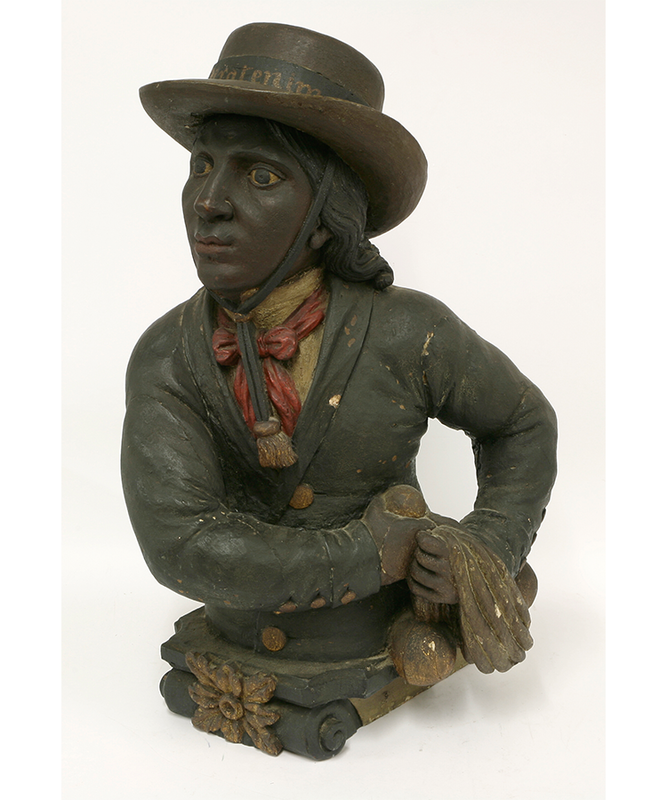 The 2ft high (63cms) high carved and painted figurehead, modelled as a South American gaucho or huntsman, originally sat at the bow of the Brazilian slave ship Piratenim, as it transported slaves from West Africa in the mid 19th Century. The British Government had already abolished the practice in 1808, declaring it to be 'contrary to the principles of justice and humanity'. In June 1851, the Piratenim was captured by the British steamer HMS Sharpshooter on anti-slavery duties off the coast of Brazil, where she was found to have 102 slaves aboard – 73 men, 26 women and 3 children – some of whom had been hidden in an unventilated secret compartment below the deck. The distinctive figurehead was also discovered stowed away in the hold, presumably in an attempt to help prevent the ship being identified. Once all slaves and crew had been removed, the empty ship was towed out to sea and burnt, as was common practice for captured slave ships at the time. But the figurehead was saved, and from Brazil made its way back to the captain's brother in Worcestershire and then to an antiques shop, where in the 1940s it was bought by the grandfather of the person now selling it. The fascinating story of its capture is told in a privately printed book by the Sharpshooter's Captain John C Bailey, along with a typed draft of 'The Last of the Brazilian Slavers, 1851' by Averil MacKenzie-Grieve, which are both included in the lot, and together with the figurehead itself have a guide price of £5,000 to £8,000. Sworders' Director John Black said: "This is a rare and historically important artefact from the time of this horrific trade. Not only is it a beautifully carved figure in excellent condition for its age, but it also comes with a vivid and exciting account of its capture. In nearly 250 years of selling antiques, we have never had the opportunity to auction something with this provenance, given that very few carvings of this age, size and subject survive. We are getting interest from all over the globe – especially the Americas - and confidently predict that it will exceed its guide price."